After January 6 German attacks in the Bitche salient were contained. Gradually the pressure wore off and the enemy retired, discouraged at what little success he had attained. Over on the right of the Seventh Army line however, persistent armored attacks hacked away at the VI Corps positions north of Haguenau. 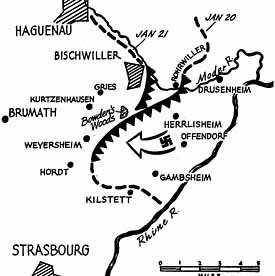 Early in January a large force of Germans had ferried the Rhine and seized a small bridgehead ten miles north of Strasbourg at Gambsheim. Efforts to dislodge the enemy proved futile, and, as the Germans poured into the small bridgehead, it developed into a prime threat to the city of Strasbourg. An attack of the 12th Armored Division on January 12-14 to destroy the Gambsheim pocket was thrown back with considerable loss. The 79th Division, on a front east and north of Haguenau, likewise was rapidly tiring under the repeated strain of German attacks. To bolster and save this critical situation, the 36th was ordered from Montbronn. The 142nd, due to return to Montbronn from XXI Corps near Saarbrucken. was waved on to Haguenau, an 80-mile total. The 141st remained in the line at Montbronn attached to the 100th Division. 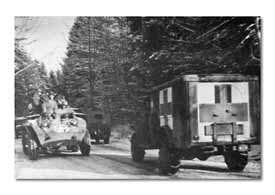 When the call came vehicles and troops poured over the slick, icy roads to meet the German challenge. (Below) General Patch, Seventh Army Commander, stops to talk to a 141st detachment on way to the front. 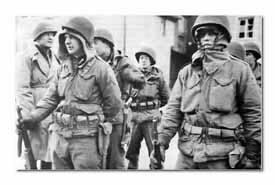 A bleak, cold Haguenau greeted the 36th. Civilians which a few weeks before had hailed liberation now gloomily considered evacuation and the return of the hated Boche. Hospital and supply installations had departed or were moving back, streets were deserted and an occasional incoming round of heavy artillery emphasized the citys danger. For the first time in Divisional history a secondary or "switch" line as constructed to back up the MLR. (Below) An AA gunner at Montbronn scans the sky from his well-dug-in position. A few miles southeast of Haguenau the German build-up in the Gambsheim-Herrlisheim pocket had reached alarming proportions. The 36th was ordered to attack to wipe out the German bridgehead, but as the infantry moved up to assembly positions on the morning of the 19th, the Corps Commander directed instead that relief of the 12th Armored Division be effected immediately. The 143rd happened on to the stage just at the right moment, for, during the afternoon, German armor broke out on the flat ground cast of Herrlisheim and crossed the Zorn Canal, the main obstacle before Weyersheirn, with twenty tanks and 500 infantry. The presence of the 143rd element in Weyersheim and the arrival of other Division reinforcements in the sector averted a clean breakthrough, and turned about and rallied the 12th Armored elements falling back before the enemy assault. Very quickly a line of defense along a small stream running southwest from Rohrwiller was selected. 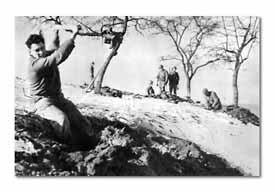 As darkness closed in, 143rd troops moved to dig in and firmly establish it, knowing that the Germans could be expected to follow-up with an even heavier attack. To the left of the new Division line enemy pressure was accentuated by the loss of Drusenheim during darkness of the 19th where a battalion of American infantry was cut off. The Rohrwiller-Weyersheim line was stabilized and strengthened on the 20th, but that evening a general VI Corps withdrawal to the Moder River north of Bichwiller pulled in the Division left, the 143rd abandoning Rohrwiller and withdrawing behind a line of the 3rd Battalion, 142nd, at the forward edge of Bischwiller. Outposts of the 2nd Battalion, 143rd, holding the large patch of woods east of Kurtzenhausen in the center of the Division line, reported contact with groups of German infantry before midnight of the 20th. By morning close-in fighting had developed and the Germans had seized the small patch of woods to the rear of the bigger one. 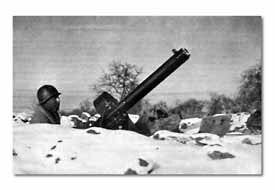 At noon waves of enemy tanks, 20 in all, with more infantry approached from Herrlisheim. 636th TD gunners took careful aim from the woods and from Weyersheim, knocked out six of them. 133rd Artillery Battalion destroyed at least one other. In the fighting that lasted throughout the afternoon, Lt. Col. Marion P. Bowden led his 2nd Battalion in a counterattack that killed 83 of the enemy and captured 176--some of the best of German troops, the 10th SS Panzer Division. Acknowledging their Colonels part in the battle, men of the 143rd have since called the scene of action "Bowdens Woods." 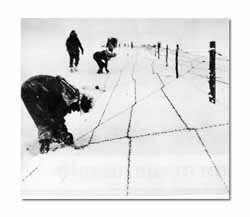 In winter's coldest weather the engineers constructed barbed-wire barriers for secondary defense. 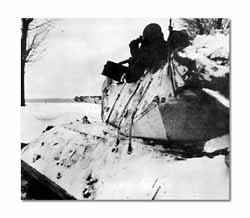 In deep snow drifts tank destroyers waited for the enemy Panzer onslaughts from Gambsheim pocket. After this turning point the enemy made few other probings of the Bischwiller-Weyersheim line. Quiet came over the sector as the defense was daily improved. Snow fell to a heavy 12-inch covering. Novel searchlight defense was introducedartificial moonlight illuminating on the darkest nights any slight movement to the front. In a week sweeping Russian gains on the Eastern Front forced the Germans to withhold further offensive operations in Alsace. Noticeably, enemy initiative died out and movement of troops away from the Gambsheim pocket was spotted. By the end of the month there was very little action anywhere along the line. The Germans had been prevented from making any inroads on the territory taken over and held by the 36th. Now they would feel the sting of another full-scale T-Patch attack.